Darryl L. Sink and Associates, Inc. designs and develops learning and performance solutions that get results for business, government agencies, and non-profits. With over 2000 projects developed, our e-learning and instructor-led training solutions provide effective, efficient, and appealing learning experiences that are integral to employee performance in the workplace. 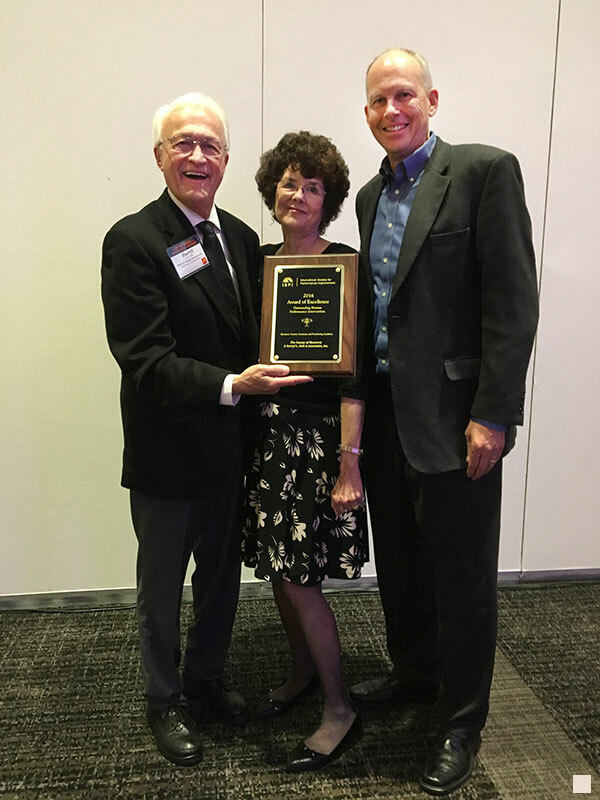 Dr Darryl Sink, Jane Sink and Dr. Peter Honebein accepting the Award of Excellence at the ISPI Conference in April. DSA/Monterey County Team Project Wins 2016 ISPI Award of Excellence! Monterey County Contracts & Purchasing Academy was selected as a recipient of the The International Society of Performance Improvement (ISPI) 2016 Award of Excellence; another in a long list of awards honoring this innovative project. The award was presented at the international conference in Philadelphia on April 11, 2016 at the awards ceremony, dinner and reception. Online lessons available to you anytime – 24/7. Work on a project of your own, with the expert help of DSA senior-level instructional designer Paul Swan, who will offer detailed feedback on your lessons. This is a one-on-one experience designed just for you and your particular project. Each lesson includes a video presentation by Dr. Darryl Sink. In addition, you will receive The Course Developer Workshop Participant Guide – 247 pages full of job aids, examples, tools and tips for success. Cost? All of this for $799. Learn proven techniques and tips for your instructional design and development, straight from DSA and our associates – for free! Contact DSA to learn more about our workshops. Read about the history of ISD models and basic learning theories in Dr. Sink’s recent chapter in the ASTD Handbook – The Definitive Reference for Training & Development (2nd edition). Also ISD: Faster, Better, Easier (PDF), published in ISPI’s Performance and Instruction Journal.